Zucchini (also called courgette or marrow) is a summer squash, similar to crookneck and straightneck, and scallop squashes. Zucchini can be green- or yellow-skinned and are usually long and cylindrical in shape, although a few round varieties have been developed. The closely-related Lebanese summer squash or kusa is pale green or white. All the summer squashes are native to the Americas, where the "three sisters" - squash, beans, and corn - have been grown together for millennia. Archaeologists estimate that squash were domesticated in Mexico between 7,000 and 5,500 BCE. Zucchini are nutritious, low in calories, and delicious. Most people eat the fruit, but the flower is also edible. In some cuisines, it is more important than the fruit. Zucchini can be prepared so many different ways that entire cookbooks have been written on the subject. Approximately 60 days to first harvest. Zucchini are easy to grow in any temperate climate. Zucchini (and other summer squash) need full sun. Summer squash roots reach three to four feet deep, and the entire area should be kept quite moist. Mulch will help preserve moisture as well as inhibit weeds. A drip irrigation system produces better results than sprinklers. Squash like very fertile soil! Old-timers used to advise a bushel of rotted manure for each plant, which worked well when every household owned cows and horses, but could be difficult today. Digging in moistened or composted peat moss and a handful of 5-10-5 fertilizer for each plant will be fine. Soil pH should be 6.0 to 6.5. 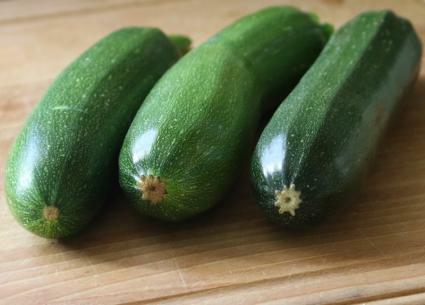 Commercial growers often sow seed at two-week intervals, but home gardeners are unlikely to need that many zucchini. In fact, these bush plants are so productive that most gardeners end up looking for ways to give away some of their crop! Many find that three or four summer squash plants, each of a different kind, are quite enough. Summer squash seeds remain viable for four years. Summer squashes are seeded directly in the garden after the last frost. Soil temperature should be between 70 and 95 degrees Fahrenheit for best germination. You can start seeds indoors and set out seedlings when there is no danger of frost if you want an earlier harvest. Plant six seeds in a group and cover them with about an inch of soil. Each group should be three to four feet apart. When the seedlings are a few inches high, thin each group, leaving the three strongest seedlings in place. Thin to one plant when they are eight or nine inches tall.Cucumber beetles attack when the squash plants are very small. Cover them with agricultural cloth or some similar material that will let in light and air but keep the beetles out and be sure to anchor the edges of the cloth securely. 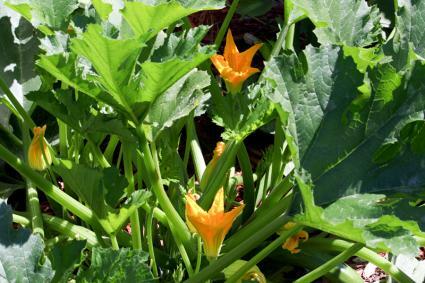 All summer squash bear separate male and female flowers on the same plant, but only the female flowers set fruit. Male flowers appear first. Female flowers follow about a week later and can be recognized by the small bump on the stalk just behind the flower. Top dress with composted manure or fertilizer two or three times, especially if the soil is poor. Water regularly. 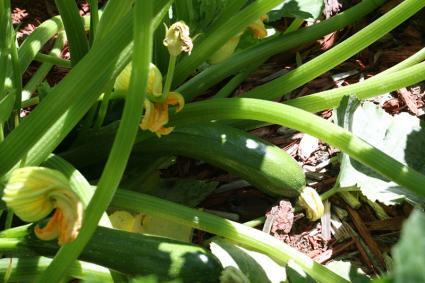 Zucchini and summer squash have the sweetest taste and the best texture when they are very small, about six inches long. Cut the fruit from the vine, leaving a piece of stem with the fruit. Zucchini left to mature on the vine become very large, with a tough skin and flat taste. Leaving them on the vine discourages production of new flowers and fruit. It's best to harvest every day at the height of the season. Summer squashes are best used fresh. They can be held about a week in the refrigerator, but they do not keep for a long period. Cucumber beetles and squash bugs are the most common pests. Squash con contract fusarium wilt, mildew, mosaic virus, and blossom-end rot, although some varieties are resistant. Plant only treated seed, rotate crops, and burn debris at the end of the season. Use fungicides if necessary.